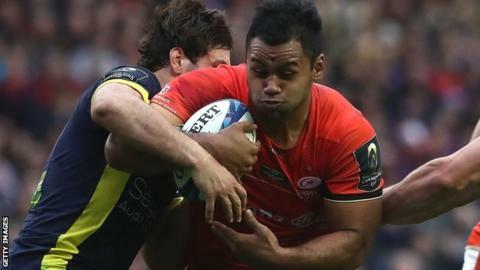 England and Saracens number eight Billy Vunipola has withdrawn from the Lions tour to New Zealand with a shoulder injury. The 24-year-old, who has 34 England caps, had been managing the injury but it now requires further treatment. He has been replaced by Wasps back row James Haskell, who will join the squad after the Premiership final on 27 May. "We really appreciate Billy's honesty in making this decision," Lions head coach Warren Gatland said. Vunipola returned to the international setup in March for the Six Nations after a four-month lay off with a knee injury. He played for Saracens in their Premiership semi-final defeat by Exeter on Saturday and appeared to be in pain during the match, receiving medical treatment on a couple of occasions. "Billy has been carrying an injury and feels he wouldn't be able to contribute fully to the Tour and needs further medical treatment," Gatland added. "We have called up James to the squad and look forward to welcoming him into camp before we depart." The Lions play their first match of the New Zealand tour on 3 June. Scrum-half Ben Youngs withdrew from the Lions squad at the start of May after his brother's wife learned that she is terminally ill. This is potentially as serious an injury blow as the Lions could have suffered. Man of the match in the recent Champions Cup final against Clermont, a fully fit and in-form Vunipola would have walked into the Lions Test team. James Haskell is deserving of his call-up - while in Taulupe Faletau there is a classy operator at number eight - but for the Lions to somehow beat New Zealand, they can ill-afford injury setbacks such as this.